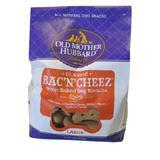 Old Mother Hubbard Bac'n Cheez Large Dog Biscuits 3-Lb. We've added another flavor to the line of Old Mother Hubbard biscuits we carry, per customer request. Can't say we blame them! Your dog will go bonkers once they get a whiff of these little bone shaped biscuits of oven-baked goodness. Can't blame them either! Each biscuit is approximately 3½ x 1-inch. Whole Wheat Flour, Oatmeal, Wheat Bran, Chicken Fat (preserved with Mixed Tocopherols, a natural source of Vitamin E), White Cheddar Cheese, Cane Molasses, Natural Hickory Flavor, Turmeric, Paprika, Eggs, Apples, Carrots, Garlic, Salt, Paprika Extracts, Mixed Tocopherols (a natural preservative).